Our Library is proud to host a Seed Lending Library! What is it? A Seed Lending Library is a source of seed you can check out for free, grow in your garden, and then return more seed than you took. This not only makes the seed library self-sustaining, but most importantly the plants will adapt to the environment – in this case – the Wet Mountain Valley. By saving seed, you will begin to adapt plants to our extreme climate. The seed library is categorized by ease of saving seeds. We recommend starting with seeds labeled “Easy.” Below is a link to a 9 minute online video, produced by Richmond Grows, which will instruct you on how to use our seed library. It is based on an honor system with just one form to fill out. There are several copies of seed books to check out from the library to help you learn how to return “true” seed. There is also educational information in a binder you can copy to take home. 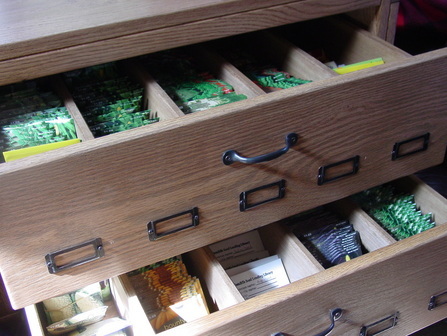 Seed libraries are a proactive response to the staggering loss of seed diversity worldwide. Historically, amateur gardeners and farmers have developed the food diversity we have enjoyed for decades simply by selecting the best for seed and eating the rest. It’s fun, it’s economical, and the best part is that you will become part of the Valley’s long and productive history of food growing. TAKE A LOOK AT THESE WEBSITES FOR MORE INFORMATION!